Look at the combination of a contemporary and barn style in this house! People have various design preferences when it comes to homes. While others want a house that is modern and neat, there are some that wants something different like a rustic style or a barn style. This is actually what you can get from the house that we will feature today. You might have seen many barn houses but this one has a mix of contemporary style that will make you like it a lot. 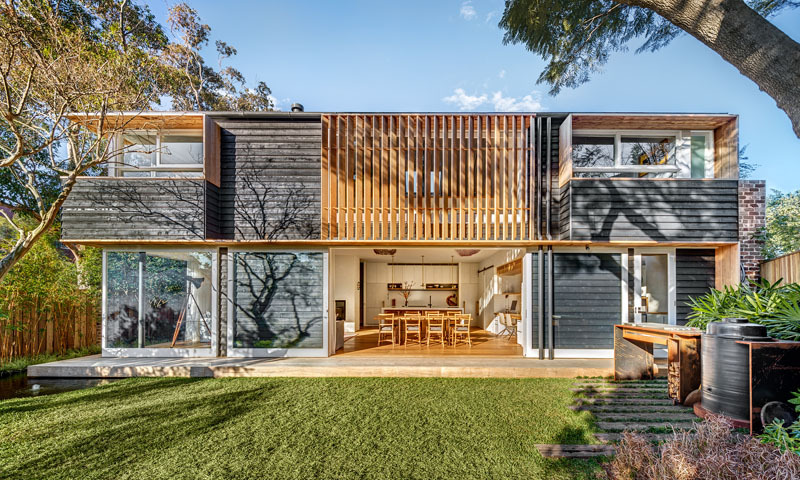 You will also love how the layout was done inside the house and how its exterior looks like. 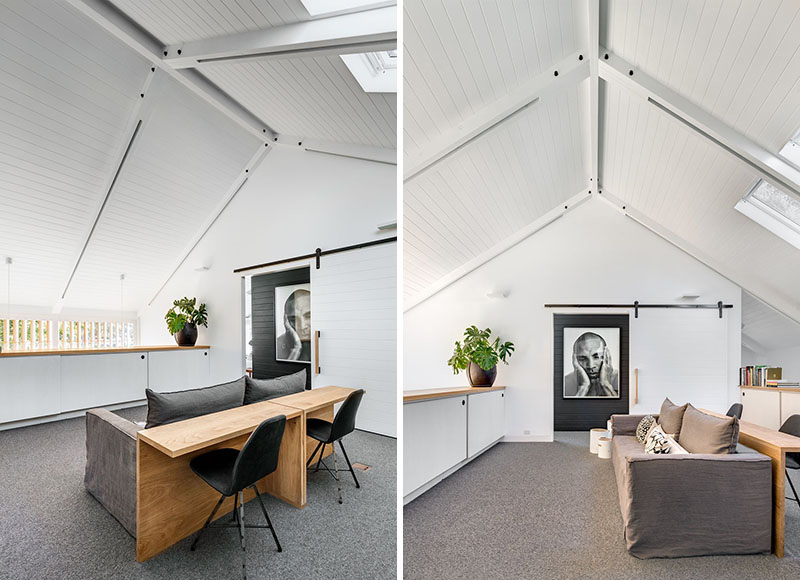 This Barn House in Australia is positioned in Bondi. The homeowner’s brief for the house was to create a living space for a family, with all the special and textural qualities of a barn. It has a simple design with large forms and volumes which are expressed in the structure and created the character of the house. 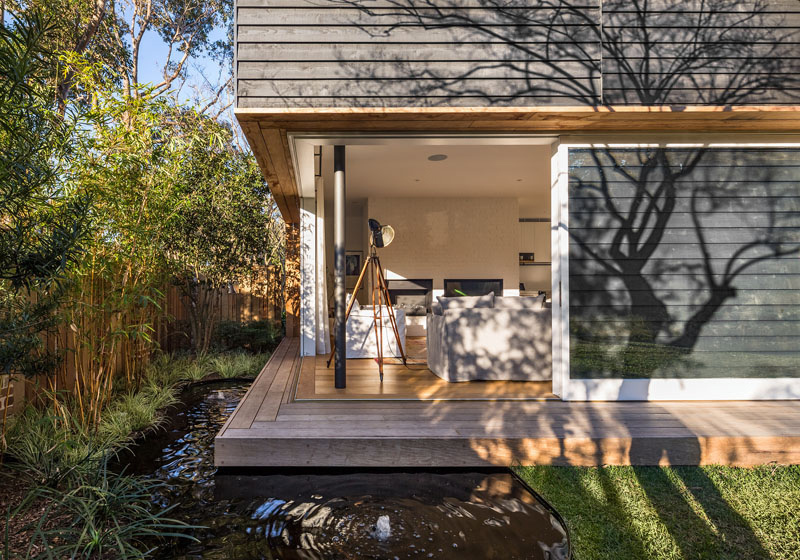 The spaces are connected both vertically through voids and horizontally through clear openings towards a Japanese inspired garden designed by William Dangar. If you will look into the pictures of the contemporary barn, you will surely fall in love with it! Scroll down and check it below. Unique feature: A beautiful contemporary barn house with a stunning exterior and lovely interior layout. 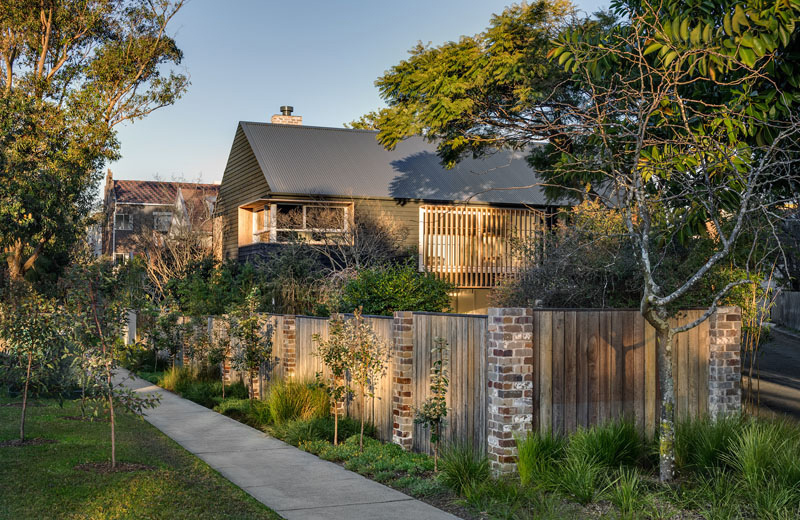 This home in Sydney, Australia, has been designed for a young family that wanted a home that would be robust and persevere the wear of everyday life. 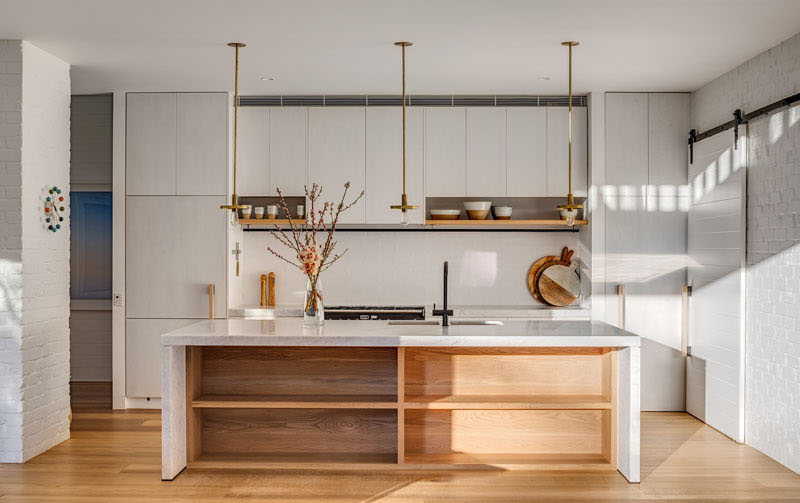 The design of the home, which is located on a triangular shaped lot, was a collaboration between the home owner, the design team from Clayton Orszaczky, and the builder, Robert Plumb Project. From the street, the house may appear dark because of its color but it is surprisingly bright and open on the inside. The interior is like the exact contrast of the exterior. What you can see here is a comfy looking chair with an ottoman. On the wall is a wooden shelf that has blue colors in it. 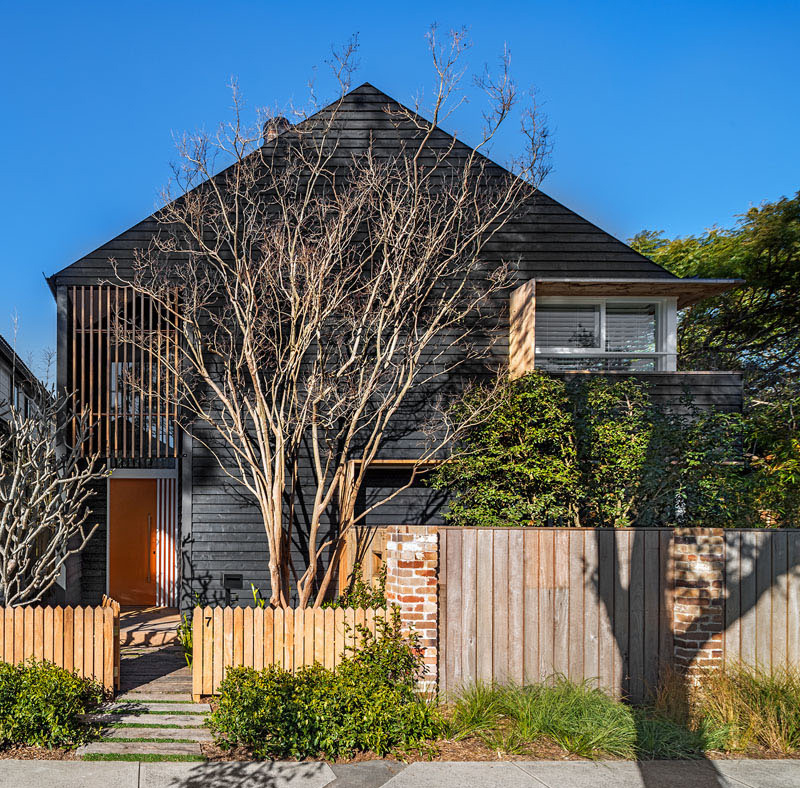 Using a palette of recycled brick, brass, internal timber lining boards, solid timber, and rough sawn tactile cladding reminiscent of shou sugi ban, the home has a contemporary and warm feeling to it. The clients ideas originated from photos of the simple timber hipped roof structures seen in the landscape of Greenland and evolved to absorb influences from traditional Japanese timber architecture and the iconic forms of barn architecture. Inside the home, the interiors have been designed by Romaine Alwill of Alwill Interiors. 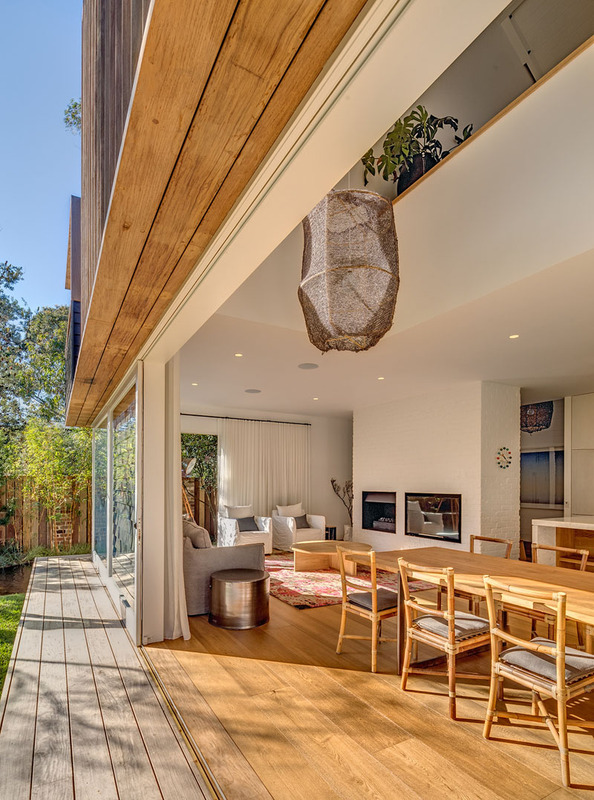 The living area, dining and kitchen all share the same space that’s open to the backyard. 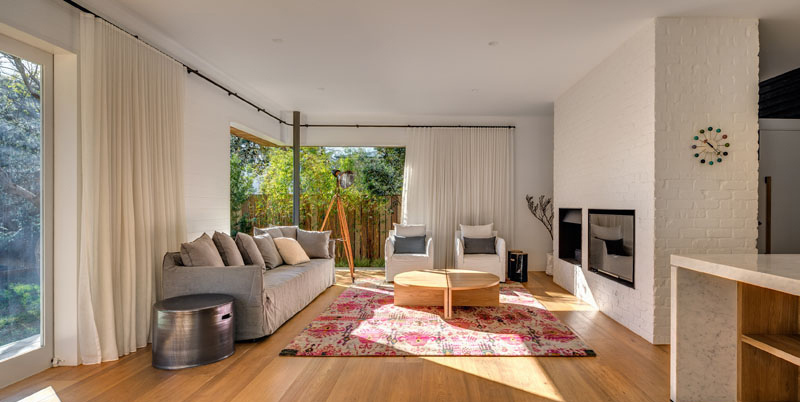 A built in fireplace and television make for a cozy living room, and when it gets too sunny, curtains can be drawn to provide shade. 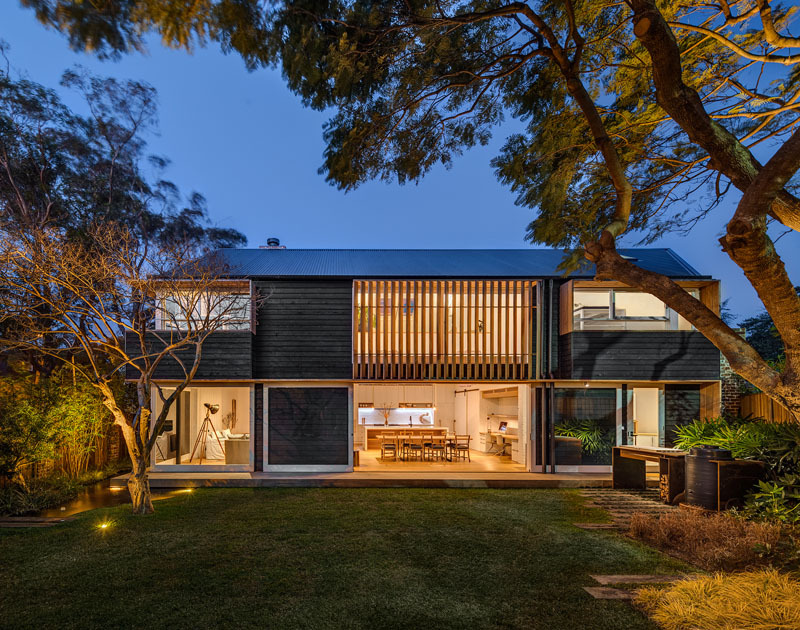 As with many Australian homes, indoor/outdoor living is often included in the design, and in this home they have achieved this by having a sliding doors next to the dining table that open directly to the landscaped backyard, designed by William Dangar and Associates. There’s also a BBQ area for cooking outside. There’s also an area for working, that’s large enough for two people to work side by side. In the kitchen, the island has exposed storage and an overhang makes it possible for people to sit at while helping with food prep. Upstairs, there’s a lounge area where you can see the barn influence, with exposed beams, a pitched roof and skylights. 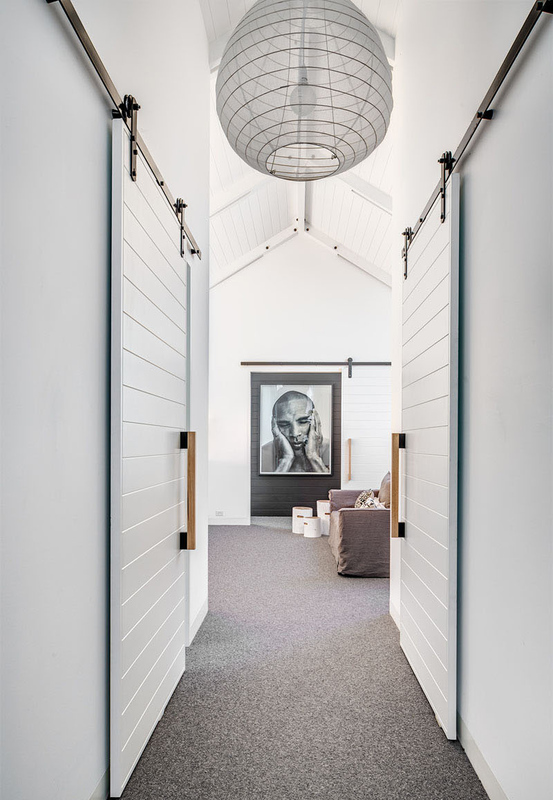 The home owner also wanted barn doors on exposed tracks, brass fixtures, and textured surfaces, which you can see have been included in these next photos. 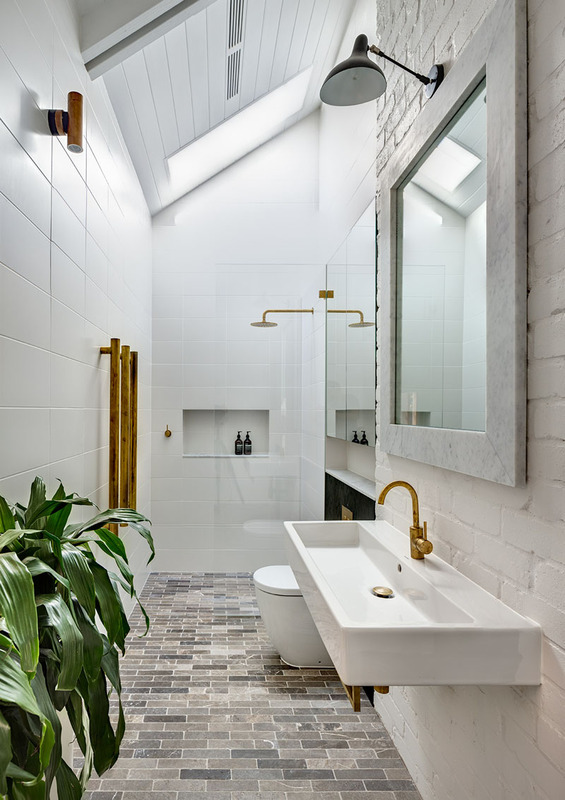 In the bathroom, white walls and ceilings make the brass accents and black cabinetry stand out. 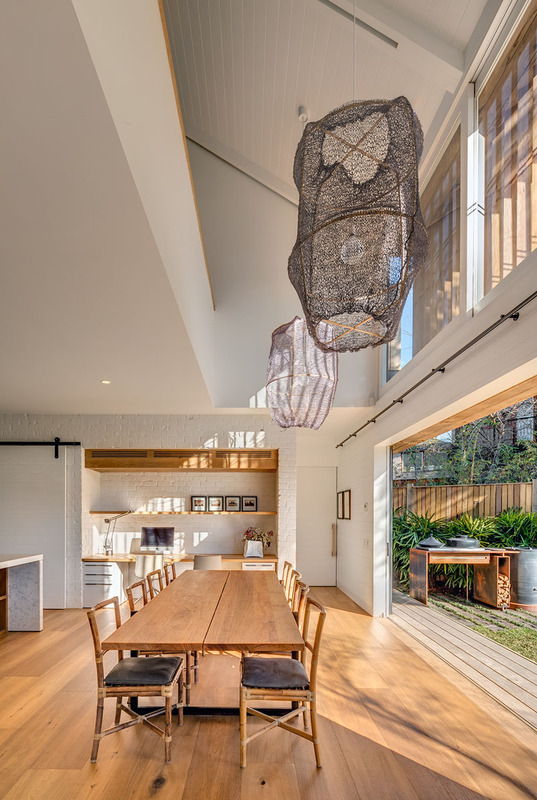 A skylight provides plenty of natural light to the space. 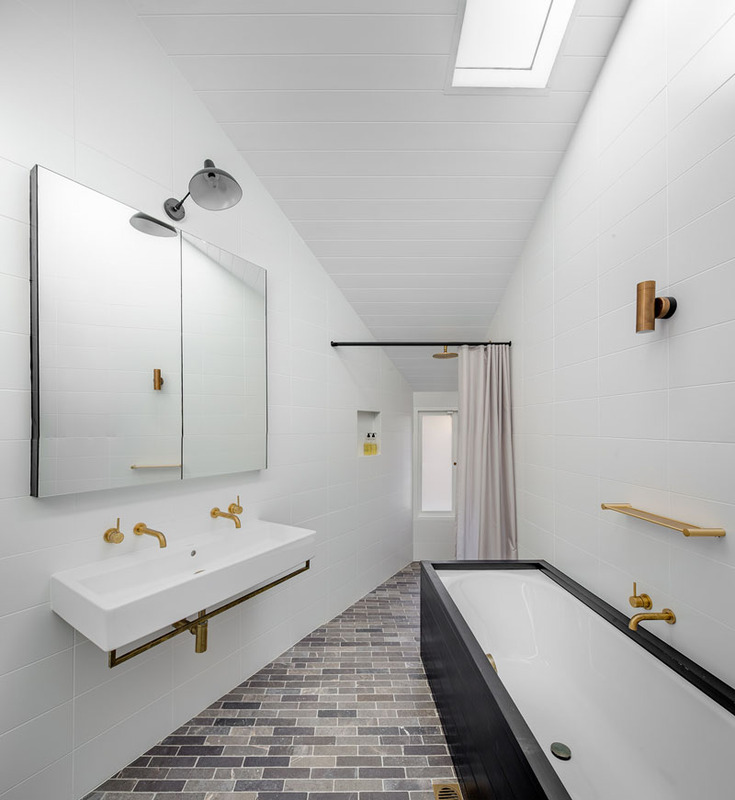 In the second bathroom the color palette is the same as the first bathroom, and a bath has been added to the space. 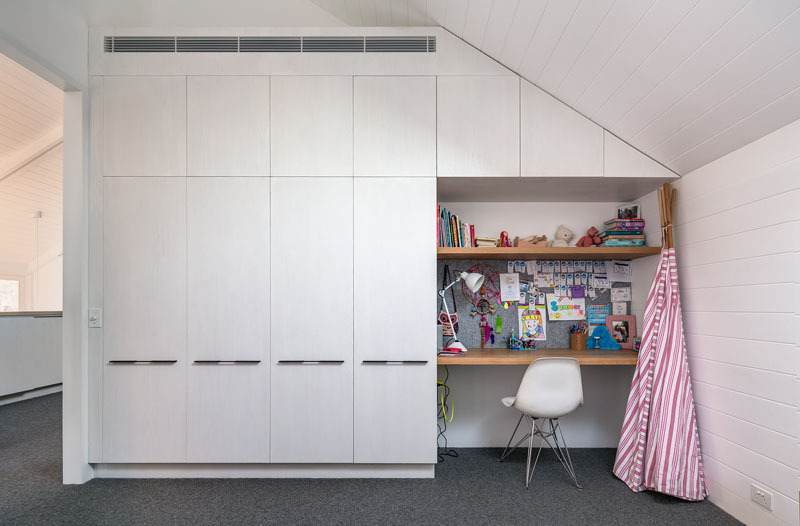 Custom built-in cabinetry makes the most of the space, and a small desk is perfect for homework. Back outside, here’s a view of the side of the home where you can see that the windows are surrounded by timber shadow rails and screens, and the fence is a combination of wood and bricks to match the home. 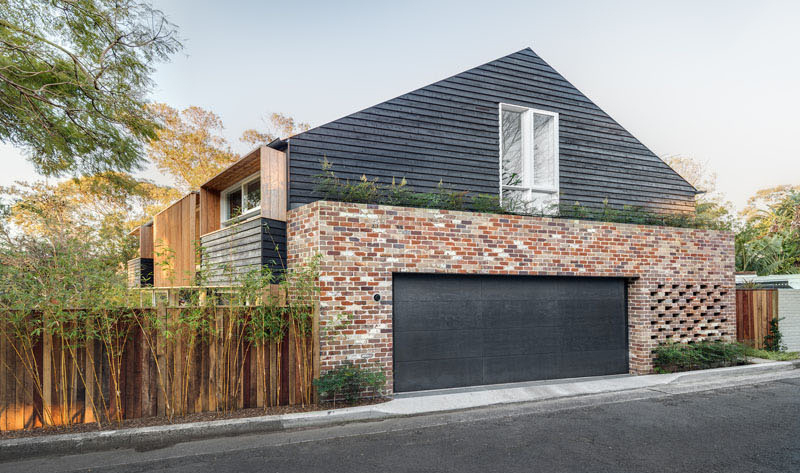 On the other side of the home is the garage, surrounded by recycled brick. Who would think that a contemporary barn can actually look this beautiful? This is indeed an amazing project by Clayton Orszaczky who managed to come up with a gorgeous home with a contemporary barn style. You can see that everything in the house is well arranged and it used furniture and decors that fit to the desires of the client. You can also see that it has a nice outdoor surrounding and it would really be good to look at it while inside the house through glass windows. Aside from that, it also used various materials from wood, glass, to bricks. Such a nice home, right?